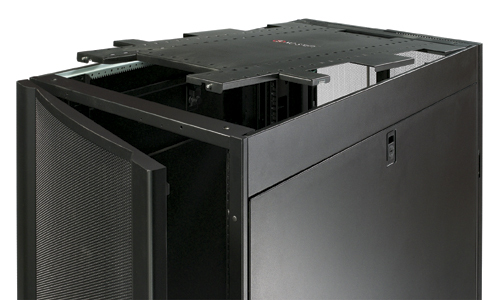 Integrated with APC InfraStruXure products APC cooling, power distribution, and cable management products work seamlessly with the enclosures to provide a complete IT infrastructure support system. Guaranteed compatibility Vendor-neutral mounting for guaranteed compatibility with all EIA-310 compliant 19" equipment. 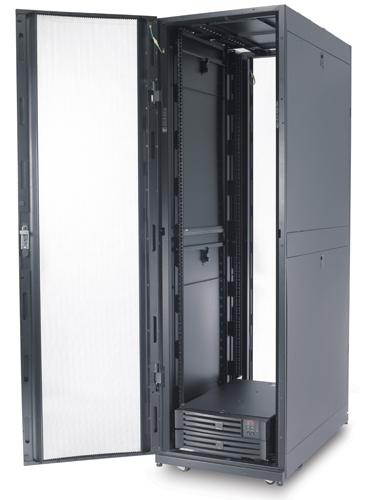 The APC "Fits Like a Glove" money back guarantee provides peace of mind that all of your EIA-310-D compliant rack-mount equipment will physically fit in a NetShelter SX enclosure. Cable Access Vendor-neutral mounting for guaranteed compatibility with all EIA-310 compliant 19" equipment. 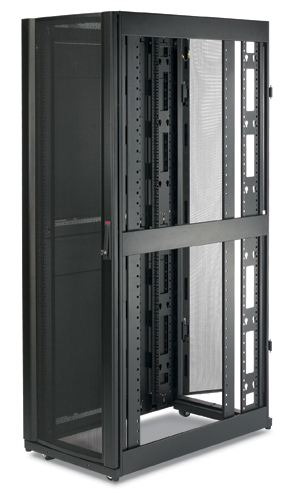 The APC "Fits Like a Glove" money back guarantee provides peace of mind that all of your EIA-310-D compliant rack-mount equipment will physically fit in a NetShelter SX enclosure. Simple Selection No need to spend hours choosing from and compiling dozens of part numbers to create a single enclosure. APC has made it easy by handling the details and providing complete enclosures with single part numbers. 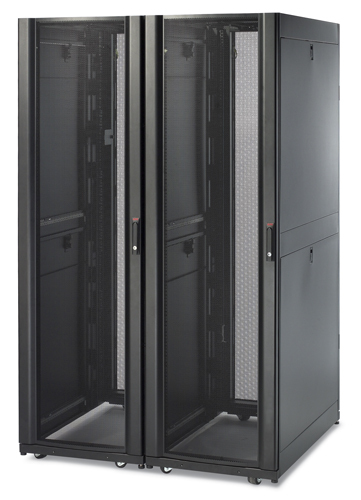 Ventilated Perforated front and rear doors provide ample ventilation for servers and networking equipment. Quick release doors Front door can be moved to the opposite side or interchanged with rear doors. Doors are easily removed with simple lift-off design. Half-height side panels Half-height quick release side panels reduce size and weight for easy handling and access to equipment. Side panels are lockable utilizing a single key with the doors. Rear Cable Management channels Integrated and adjustable rear channel provides zero U mounting locations for toolless accessories. 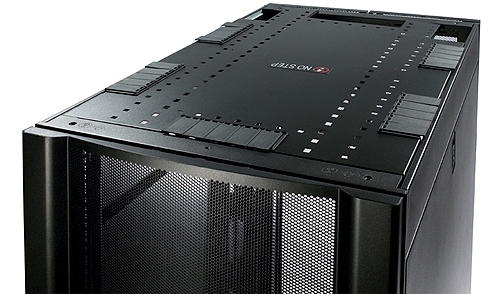 Each channel has two mounting bays to support a combination of up to four accessories such as PDUs and vertical cable organizers. Adjustable mounting rails The vertical mounting rails can be adjusted in 1/4 in (6.4 mm) increments covering virtually any mounting requirement for IT equipment. U positions are numbered front and back for rapid installation of equipment. Adjustable leveling feet Leveling feet can be quickly adjusted through the use of a screwdriver or drill, eliminating the need to reach underneath with a wrench. Enclosures are shipped standard with both leveling feet and castors. Overhead cable management Overhead cable troughs and partitions install toollessly on the roof of the enclosure eliminating the need for ceiling mounted or underfloor mounted cable trays. 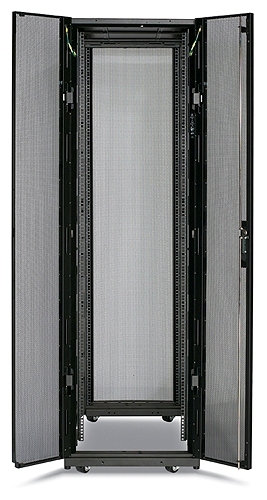 Cable troughs and partitions are designed to manage both power and data cables while maintaining separation. Structural Stability A proven frame design, heavy-gauge mounting rails, and heavy-duty casters provide for 3000 lb (1364 kg) static and 2250 lb (1023 kg) dynamic load ratings.